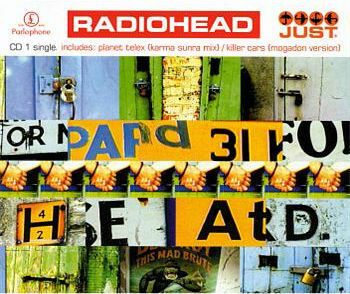 "Just" is a MTV Video Music Awards-nominated single by the English rock band Radiohead, released in 1995. It is the seventh track on their 1995 album The Bends. Radiohead frontman Thom Yorke wrote the song about a narcissistic friend of his, which on closer inspection is showcased by the imagery in the lyrics - a parallel to earlier My Iron Lung EP track "Lewis [Mistreated]". He also says that it was something of a competition between him and Jonny Greenwood to see who could fit the most chords into a song. "Just" is especially notable for Greenwood's guitar solo. In the UK, this single was available as two CDs: the first one featured different tracks, and the colour of the album art on the second single was inverted. In 2007, NME placed "Just" at number 34 in its list of the 50 Greatest Indie Anthems Ever.